Reminder – Nickerson paving work resumed today! Crews are working four consecutive weekends, Friday AM through Monday AM, to demolish and repave the intersection at W Nickerson St, between 15th Ave W and 14th Ave W.
Starting October 8, Monday AM through Thursday PM hours will be added. This is for Zone C of the Nickerson paving project. Closure | Intersection of W Nickerson St, E of 15th Ave W.
NB 15th Ave W to EB W Nickerson St.
WB W Nickerson St to W Emerson Pl. EB W Emerson Pl to NB 15th Ave W.
NB 15th Ave W; WB W Dravus St; NB 20th Ave W; NB Gilman Ave W; EB W Emerson Pl/overpass; to EB W Nickerson St.
D Ramp/underpass; SB 15th Ave W; W Dravus St exit; WB W Dravus St; NB 20th Ave W; NB Gilman Ave W; to EB W Emerson Pl. WB W Emerson Pl; SB Gilman Ave W; SB 20th Ave W; EB W Dravus St; to NB 15th Ave W.
Closure | Interchange at W Nickerson St, between 15th Ave W and 14th Ave W.
WB W Nickerson St to NB 15th Ave W.
EB W Emerson Pl to EB W Nickerson St.
D Ramp/underpass; SB 15th Ave W; W Dravus St exit; WB W Dravus St; to NB 15th Ave W.
SB Gilman Ave W; EB W Dravus St; NB 11th Ave W; to EB W Bertona St. These King County Metro buses will be rerouted from W Nickerson St to 14th Ave W, and then to W Dravus St, intermittently. To accommodate this, street parking on 14th Ave W will be temporarily suspended. Closure | Interchange at W Nickerson St, between 15th Ave W and EB Nickerson. Closure | Partial* of W Nickerson St, NE of intersection. *W Nickerson intersection open to 2-way traffic via temporary lane shifts. Contact us directly at NickersonPaving@seattle.gov or (206) 256-5252 (voicemail line). Visit our webpage to learn more about the project. Thank you for your patience during this paving and pedestrian improvement work! Saturday morning, we’ll be closing 500 to 1000 feet of the Fauntleroy Expressway portion of the West Seattle Bridge. Approximately 9 Jersey Barriers struck in a recent vehicle collision must be moved back into their protective alignment. Our Roadway Structures team will maneuver and realign the jersey barriers, in an area currently coned and taped off. 500 to 1000 feet of WB and EB left lanes of Fauntleroy Expressway, just E of 35th Ave SW. Starting today, 23rd Ave Corridor Improvement Project crews are completing improvements at Rainier Ave S and 23rd Ave S, reducing travel lanes as needed. Then Saturday night through Sunday morning they’ll pave 23rd Ave S, from Massachusetts to Rainier; the work is weather dependent – and rescheduled from last weekend. Curb lanes will be closed when crews are drilling and pouring concrete foundations for signal poles. Rainier Ave S – reduced to 1 lane both NB and SB as needed, before/after intersection. S Hill St – E and W legs closed to through-traffic; local access will be maintained. This work is weather-dependent and may be rescheduled if necessary, as it was from 9/22/18. 23rd Ave S – fully closed to traffic from S Massachusetts St to Rainier Ave S; detour signs posted. Visit the 23rd Ave Corridor Improvements Project web page for more project information. 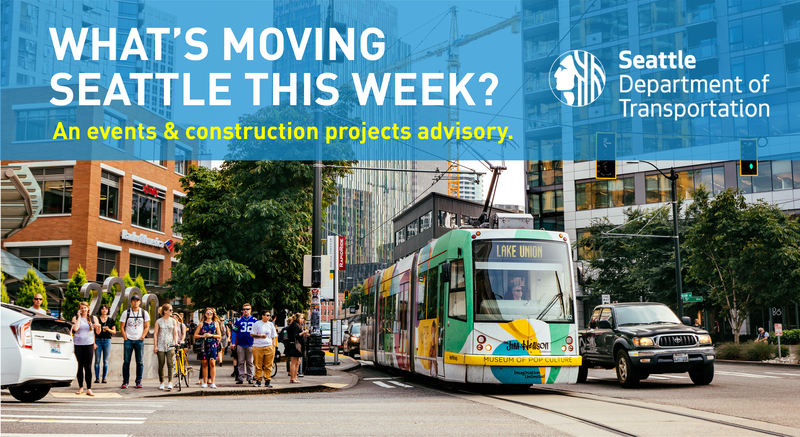 If you have unanswered questions, contact the team at 206-727-8857 or 23rdAveCorridor@seattle.gov. SW Admiral Way had weather on its side yesterday, allowing crews to repave the outside southbound lane, from SW Hanford St to SW City View St. The new smooth asphalt replaces an unraveling the curb and deteriorating conditions due to spring water. Thanks to Tracy for a heads-up on the Google Map reference below, linking to the right Admiral segment. Here’s to sharing helpful information! This Sunday, weather permitting, our crews will remove and repave the top 2 inches of the outside southbound lane of SW Admiral Way, SW Hanford to SW City View St.
Crews will repave the outside southbound lane of SW Admiral Way, between SW Hanford and SW City View St.
Traffic will be restricted to a single lane in each direction during working hours. Parking will be restricted during working hours. This project is part of SDOT’s Arterial Major Maintenance (AMM) program; which is funded by the Move Seattle Levy. This Sunday, weather permitting, crews will pave University Way NE, from N 50th St to Cowen Place NE. Be prepared for traffic slow downs and the closure of Cowen Place NE, during the work. Paving of University Way NE, from N 50th St to Cowen Place NE. Thank you for your patience while this work is completed!